From necklaces to bracelets, rings and earrings, when it comes to Native American jewelry, each and every piece has a story. Handmade from sterling silver and accented with turquoise, spiny oyster and other colorful, natural materials, Native American jewelry is both incredibly beautiful and completely unique among pieces created by other cultures. Why? Because the jewelry made by Native American tribes is created primarily from materials that can be found where they live, and have lived for hundreds of years. 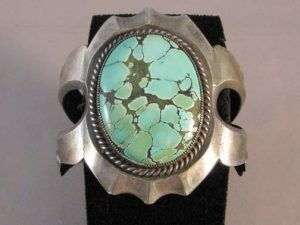 The art of Native American silversmithing began in the 1800s when the Navajo people came into contact with the Spanish. From there, trade grew and evolved as it was passed down through members of the tribe, as well taught to individuals from other tribes. As silversmiths across tribes began honing their skills, different styles of work evolved, giving each tribe’s jewelry its own specific look and feel. 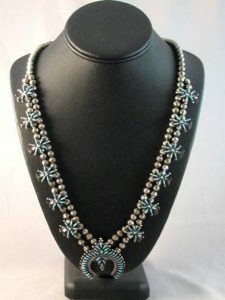 For example, the Navajo people worked mainly with turquoise and silver, stamping crescent shaped naja necklaces and embedding them with bright turquoise stones. These pieces were considered symbols of power and were worn by important members of the tribe. Concha jewelry was also incredibly popular, and this style of work could be seen on everything from necklaces to belts and hair accessories. Toward the end of the 1800s, the Zuni people began making jewelry of their own with a focus on lapidary work. Zuni lapidarists wer e incredibly skilled at setting and inlaying stones into metal, creating an opportunity for Zuni and Navajo artists to work together to create unique jewelry. Oftentimes, a Navajo silversmith would create the detailed silver piece; then the Zuni lapidarist would decorate it with gorgeous stones. Originally, the jewelry made by Native American people was created only for members of the tribe, but as the twentieth century progressed and silversmiths’ talents grew, more and more jewelry was sold to traders and individuals outside the tribe. When you look at a piece of Native American jewelry, the stamped metal, stones and the technique used to make it all have a deep meaning; a connection to history. Here at Kachina House, we proudly offer Navajo, Zuni and Hopi-made pieces new and old. 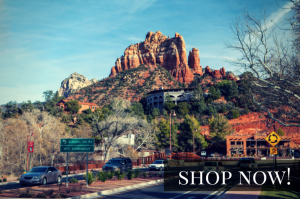 Browse our selection of necklaces, earrings, bracelets and more online, or visit our Sedona, Arizona showroom if you’re in the area! Also, you can now shop at our Etsy shop online!